The Touch 'n Trophy Plaque, is another unique addition to our line of hand-crafted After The Shot Trophy Plaques. 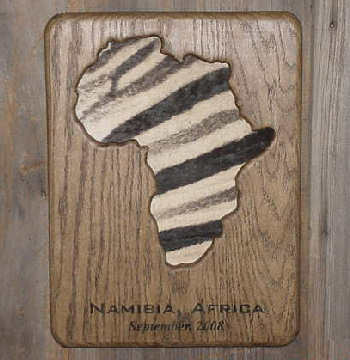 These distinctive plaques feature a cut-out of the state, country, or continent of your choice where you can then mount a piece of your trophies tanned fur/hide through the back allowing you to then touch and feel it from the front. With the Touch 'n Trophy plaque you’ll not only be able to see the differences in animal furs but you’re able to feel the distinct differences in their textures as well. You can mount practically every kind of tanned fur in it like deer, rabbit, fox, elk, antelope, mountain lion, bear and even zebra! The possibilities are endless with the Touch 'n Trophy! The maximum size of the Touch 'n Trophy is 12" wide by 18" high. Depending upon the desired cut-out they may be smaller to keep it appealing to the eye. 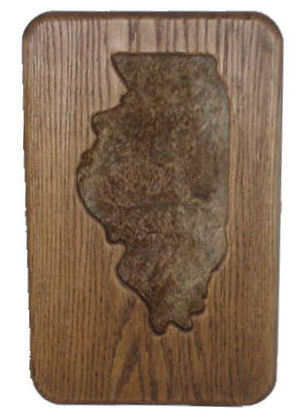 For example, the Africa plaque above measured 12" wide by 16" high and the Illinois plaque measured 12" wide x 18" high. 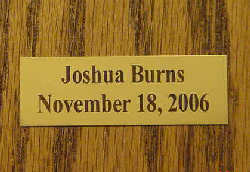 Fur/hide and engraving is not included with the Touch 'n Trophy Plaque.